Straw bale gardening is an ancient farming technique used in many cultures. If garden space or physical mobility is limited, straw bales provide an easily accessible growing medium for everything from herbs and lettuces to tomatoes and squash. Straw bales are available at local feed stores, farm centers and from local farmers. When purchasing straw bales, consider size, transportation of bales and price. 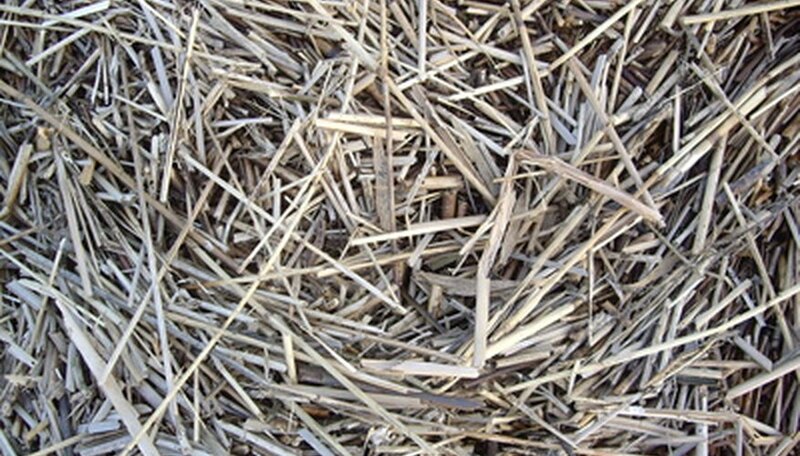 Most straw bales survive one to two planting seasons before breaking down into usable compost. Purchase freshly-baled oat or wheat straw, pale to bright gold in color. Never use hay, typically made from alfalfa and other grasses, as it is full of grass and weed seeds. Choose a permanent location and pattern for the bales before you begin planting. Make certain that the placement will allow easy access to the plants during the growing season. Set the bales in place with the twine running horizontally. Twine placed against the ground will decay and allow the bale to fall apart. Soak each bale with water five to seven days before planting. Rough up the top of the bale with a garden fork to allow for root growth during the season. Spread equal amounts of organic compost and potting mix or weed-free garden soil over the top of each bale at a depth of at least 3 inches. Sow seeds according to package directions. Follow spacing recommendations as if planting in a garden. Plant no more than two to three plants per bale for larger vegetables such as tomatoes, cucumbers, peppers and eggplant. Plunge a sharp trowel into the desired location for each seedling. Place the holes away from the edges to avoid severing the twine. Pull the straw apart, using the trowel as a lever, to create a crevice for the seedling. Hollow out a small hole and fill it partially with potting mix or compost, if the straw is too tightly-packed. Insert the seedling into the crevice and allow the straw to spring back into position. Water each bale thoroughly six to seven days per week and daily during extremely hot weather. Apply water-soluble, organic fertilizer, according to manufacturer's recommended dosage. Pull random weeds as they appear, as the bales contain residual seeds that will sprout after the bales have been soaked. Remove the twine after one to two growing seasons and spread the composted straw over the area. Place new bales on top of the straw compost for the next growing season, if you wish. Natural plant foods such as compost tea or liquid fish emulsion can be used in place of commercial fertilizers. Plant pansies, marigolds or asters around the perimeter to create a more visually appealing garden. Straw bales heat up after being soaked, which can destroy young seedlings if planted immediately. Avoid planting tall vegetables, such as corn. The straw is not strong enough to support the root structure or height of taller plants. Avoid planting root crops, such as onions, carrots, potatoes and garlic, in straw bales. There is not adequate room for the roots to develop properly.